Engaging Disruptive Innovation. The evolving role of POCUS in clinical medicine and medical education. Who among us didn’t get through high school without regularly reaching for a well-thumbed encyclopedia plucked from a shelf in our parents’ basement or local library reference room? Not me, to be sure. Whether it was how rubber is manufactured, legislative accomplishments of a long-deceased prime minister, or the agricultural exports of Guatemala, the encyclopedia could always be counted on to provide reliable information, in time for whatever deadline was looming. The word “encyclopedia” itself has an interesting and revealing etymology. It apparently contains elements of word origins for “circle” (interpreted to mean “complete” or “all-inclusive”), “child” and “education”. We all know the word to refer to a comprehensive, single source that brings together diverse information. An encyclopedia is a one-stop-shop for a little bit of everything you might need to know about anything. The most venerable example is Encyclopædia Britannica, first published in 1768 (https://www.britannica.com/topic /Encyclopaedia-Britannica-English-language-reference-work). The 2010 edition consisted of 32 volumes and 32,640 pages. It was written by about 100 full-time editors and more than 4,000 contributors. Contributors have included Nobel laureates and five American presidents. That 2010 edition version was its last print edition. 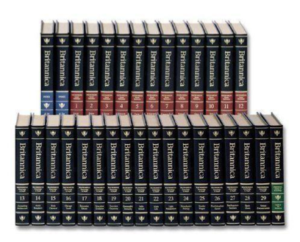 After 242 continuous years, Encyclopedia Britannica went out of the print business. It was a victim of what has come to be known as Disruptive Innovation. 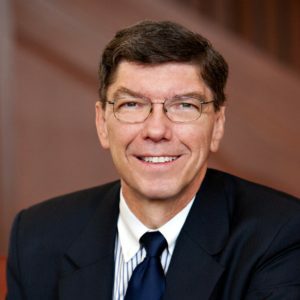 That concept emerged in the 1990s and is most commonly attributed to Clayton M. Christensen who has written extensively on the topic as it plays out in the business world and explains the rise and failure of various enterprises. The disruptive innovation that lead to the demise of print versions of Encyclopedia Britannica was, of course, Wikipedia. It provided an easily accessible, comprehensive and continually updated source of information at no direct cost to the consumer. The fact that it lacked historical status, cachet or even a reputation for the accuracy of its sources was glossed over by the consuming public who were very willing to set aside all those considerations for the convenience and economic advantages. The disruptive innovators, for their part, have the courage of their convictions. They believe they understand market forces better than the established providers, and are willing to gamble that they’re right. Basically, they believe in letting the market decide. The medical world, of course, is certainly not excluded from disruptive innovations. In fact, it has benefited greatly, but not always willingly. An example I’m very familiar with from the cardiology world is Percutaneous Coronary Angioplasty. 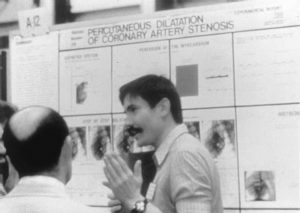 When first introduced by Dr. Andreas Gruentzig in 1977, this innovation truly set the cardiovascular world on its collective ear. Prior to that, therapies for coronary occlusive disease were limited to medical therapies (provided by cardiologists) and coronary bypass surgery (provided by cardiac surgeons). The dichotomy and division of labour were clear and well accepted. The catheterization laboratory was a place for diagnostic investigations to determine the extent of disease, not a place for therapeutics. Gruentzig’s innovation completely upset the existing paradigm. Moreover, it put the interventional cardiologists in the driver’s seat, because they could link the therapeutic intervention to the diagnostic procedure, therefore engaging the issue first and therefore, potentially, circumventing the role of the cardiac surgeon. The simple intuitive appeal of being able to dilate an obviously obstructed vessel without the need for even a second interventional procedure, much less surgery, was powerfully compelling, and both the medical community and patients were very willing to set aside the usual and well-established need for controlled comparative trials before embracing this new technology enthusiastically. The development of Hand-Held Ultrasound (HHU) and its clinical counterpart, Point of Care Ultrasound (POCUS), could be considered further disruptive innovations facing the medical community. 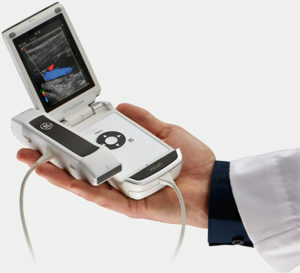 Ultrasonic imaging, by virtue of its ability to provide information on a variety of structures in a non-invasive, non-toxic manner and at relatively low cost, has taken on a key role in medical diagnostics, ranging from cardiac (where it is known as Echocardiography) to abdominal, thoracic and vascular imaging. It was initially provided only with large and complex machines that were not easily transported, and provided images and measurements which were imprecise, difficult to obtain and required “expert” recording and interpretation. The technology therefore required third party interpretation and consultation before results could be reliably utilized to guide patient care. Over the past decade or so progressive technical advances have made it possible to obtain excellent quality images from small devices that can be carried easily and used at the bedside. This technology is such that it can be used by an individual to guide the diagnostic approach and decision-making process, analogous to how physicians use stethoscopes. Although the HHU technology is not yet able to provide the full package of information that would allow it to completely replicate the comprehensive examination, it’s not unreasonable to expect that will occur in the not-too-distant future. In addition to challenging the role of ultrasonic imaging as a diagnostic procedure, this technology is also challenging our approach to the clinical examination in medical school, where students and educators are asking very valid questions as to the role of these “competing” technologies. I recently participated in a symposium at the Canadian Cardiovasular Congress recently exploring this very topic. Together with my colleague Dr. Amer Johri, as well as Dr. Sharon Mulvagh from Dalhousie, Dr. Rob Arntfield from Western University, and our former Echocardiography Fellow (now staff Cardiologist at McGill) Dr. Hanane Benbarkat, we explored current and further applications of HHU and POCUS, all centred on its fundamental impact on patient care. Dr. Johri has been active in the development of guidelines for its application in medical education (Journal of the American Society of Echocardiography 2018;31:749), and has been working with Dr. Steven Pang of our department of Biomedical and Molecular Science to introduce the technology within our curriculum. Based on work carried out by Dr. Benbarkat during her fellowship at KHSC and hopefully extended to further collaborative studies with other centres, integrated utilization of POCUS by hospital-based Echo Labs is feasible and beneficial. In other words, it was, at least in part, a failure to deviate from previously successful practices that prevented well-established firms from engaging disruptive innovations, ultimately to their detriment. Such innovations challenge us to step away from what we consider to be the “tried and true” methods and approaches we have come to rely upon. They will always entail an element of risk and uncertainty, and therefore require what might be termed a leap of faith. In the medical world, that leap is only justified by a considered, clear potential to improve patient outcome. All other considerations must take a back seat.